For those of you glued to the screens for the Olympics this summer, a tasty treat is probably the call of the day to keep up with the excitement. And in the spirit of the Olympics, surely a healthy tasty treat is in order? 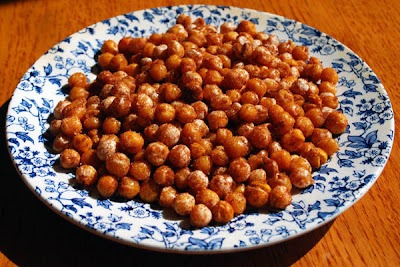 These chickpeas are simply roasted for half an hour and then mixed with some seasoning to offer a rather more-ish snack. I was amazed at how tasty they were and offer a nice change to my usual sofa snack of crisps and ice cream (not at the same time, of course). 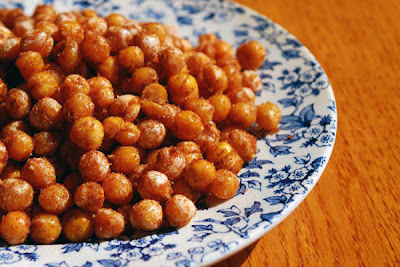 Be aware that a couple of the chickpeas might pop in the oven like popcorn, but most of them will come out fine. And maybe switch up the cinnamon for your favourite spice such as nutmeg or cayenne pepper if that takes your fancy. in a small pot mix together the cinnamon, sugar and salt. set aside. when the chickpeas are looking crispy they pale in colour and shrink a little. remove the chickpeas from oven and tip into a heatproof bowl. add the olive oil and stir thoroughly to coat all the chickpeas. tip the spice mix into the bowl and mix well. Yum. I do these chickpeas with smoked paprika & add cashews. Absolutely delicious. that sounds amazing! I'm definitely going to add cashews to my next batch. Try mixing them before roasting with a little oil and ground cumin, coriander and cayenne (or be lazy and just use garam masala). Sea salt and ground black pepper is gorgeous too.